The global marine fuel management market was valued at approximately US$ 4.0 Bn in 2016 and is projected to expand at a CAGR of over 4.0% from 2017 to 2025, according to a new report published by Transparency Market Research (TMR) titled ‘Marine Fuel Management Market – Global Industry Analysis, Size, Share, Growth, Trends, and Forecast, 2017–2025’” The report interprets that stringent regulations regarding marine vessel emissions and usage and rise in prices of marine fuel are likely to boost expansion of the marine fuel management market in the coming years (2017 to 2025). Asia Pacific and Europe account for a dominant share of global marine fuel management market. Increase in marine fleet size and heavy ship movements on Asia Pacific ports are likely to drive the marine fuel management market in Asia Pacific. The market in the region is projected to expand at a CAGR of around 4.5% during the forecast period. The global marine fuel management market is primarily driven by the increase in demand for marine fuel in vessels and fleets. The operating cost of vessel mainly depends upon the marine fuel cost. High prices of fuel oil have led to the need for efficient management of marine fuel. Thus, rise in prices of marine fuel oil is expected to propel demand for marine fuel management systems. Strict laws against the consumption of natural resources such as crude oil have compelled fleet owners to use of marine fuel oil conservatively. These stringent regulations against the use and emissions of marine fleets are likely to drive the marine fuel management market. Rise in demand for marine transportation is expected to lead to increase in consumption of marine fuel, thus propelling the marine fuel management market. Furthermore, technological advancements in monitoring and metering systems is projected to offer lucrative opportunities to the marine fuel management market during the forecast period. However, lack of accuracy and security concerns in marine fuel management systems are likely to hamper the market in the near future. The report offers detailed segmentation of the global marine fuel management market based on process and application. In terms of processes, the measuring segment is likely to account for a dominant share of the global market during the forecast period. The monitoring segment is expected to expand rapidly owing to increasing adoption rate of monitoring function in marine fuel management systems. Monitoring systems employ various methods and technologies to monitor and track fuel inventories, fuel purchases, and fuel dispenses. As fleet owners are concerned about the consumption rate of marine fuel oil, fuel monitoring is anticipated to drive the marine fuel management market. In terms of application, the efficiency level segment is projected to hold a dominant share of global marine fuel management market during the forecast period. The segment is likely to expand at CAGR of around 4% from 2017 to 2025. The fleet management segment is projected to expand at a CAGR of approximately 4.5% during the forecast period. Ten year down the line, fleet owners are expected to concentrate on fuel management, vessel maintenance, driver management, equipment maintenance, vessel safety & compliance, and operational efficiency. This rising awareness among the fleet owners due to increase in the marine fuel prices and strict emission laws are expected to propel the fleet management segment. 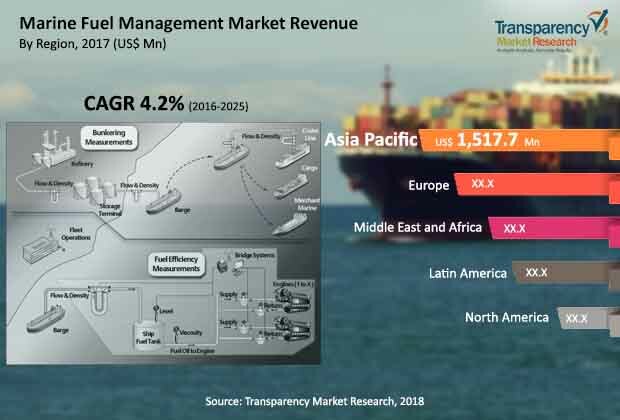 On account of marine fuel trading activities, fleet sizes, port activities, and marine fuel consumption, Asia Pacific and Europe are the leading regions of the global marine fuel management market in 2016. Asia Pacific is a rapidly expanding region of the market. Economies such as China and Singapore witness substantial movement of merchant vessels. They have been investing substantially in navigation automation, MFM systems, dynamic positioning of vessels, ballast water management, fuel consumption meters, density and viscosity meters. Increase in shipbuilding, flag conversions, and vessel software upgrades as per the requirements of IMO activities are the major factors boosting the marine fuel management market in these regions. The report also provide profiles of leading players operating in global marine fuel management market including ABB, Aquametro AG, Banlaw Systems Ltd., Bergan Blue, BMT Group, DNV-GL AS, Emerson, Endress+Hauser Management AG, Eniram, Interschalt Marine Systems GmbH, Kaminco, Krill Systems, Inc., Marorka, Mustang Technologies, Nautical Control LP, and Siemens AG. Geographical expansion of resources and facilities is one of the key strategy adopted by major players, and new product developments and relationship management are the few approaches followed by other key players.